How often have we looked at an 18th-century instrument and wondered what tales it could tell, what experiences it has had? Sadly, except for the most famous examples, the stories of most instruments are unknowable to us. Precisely what necessitated the new top is a mystery but it was probably the result of damage to the original. 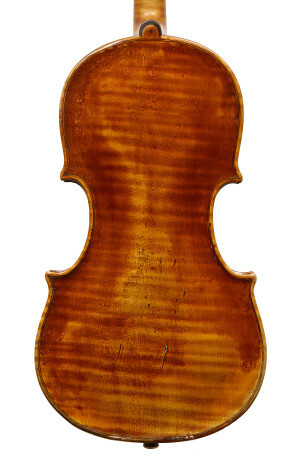 Restoration in the 19th century was a very undeveloped practice and it was instead common for damaged parts to be wholly replaced by the nearest available maker. 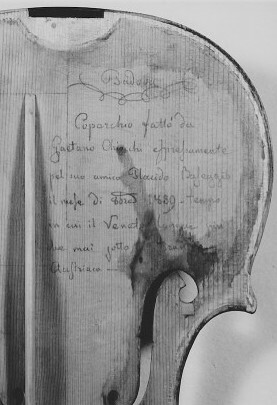 With this repair, Chiocci not only performed a favor to his friend, but he preserved the work of an important Venetian maker about whom there is much debate and excitement. With his inscription, he preserved an important story for future generations.